The AIS is a very useful system. This is an automatic tracking system used on ships. It is a combination of transmitters and receivers which are on board vessels, coastal stations that receive information and send them forward, database which stores information and distribute them, and ways of communication between system modules. The instrumentation of the AIS is based on international standards and is used all around the world. The AIS is used by Icelandic shores, but there are still loopholes in the system which is yet to be fixed, therefore it sometimes happens that vessels close to shore drop out of the system. This happens quite often on Westfjords if the vessels are close to shore and therefore it is good for those who practice pleasure fishing to be aware of this in order to be able to respond correctly if this situation occurs. The costal stations call up the vessels which drop out of the system. Therefore it is necessary to listen carefully to channel 16. The employees of the Icelandic Maritime Administration set up the first land station for the AIS in the Blue Mountains in the spring of 2004. By the end of the year 2007, the land stations had become 15 and the system now covers all waterways and the principal fishing grounds by the land, up to 70 nautical miles (130 km) to the sea, but it coverage does does not cover all fjords and bays. Users of information from this system here on Iceland are especially: the Maritime Traffic Service, the Icelandic Coast Guard, the Port State Control of the Icelandic Maritime Administration, harbours, the Directorate of Fisheries and captains. In addition, the North Atlantic Treaty Organisation (NATO) has access to the information collected by AIS. 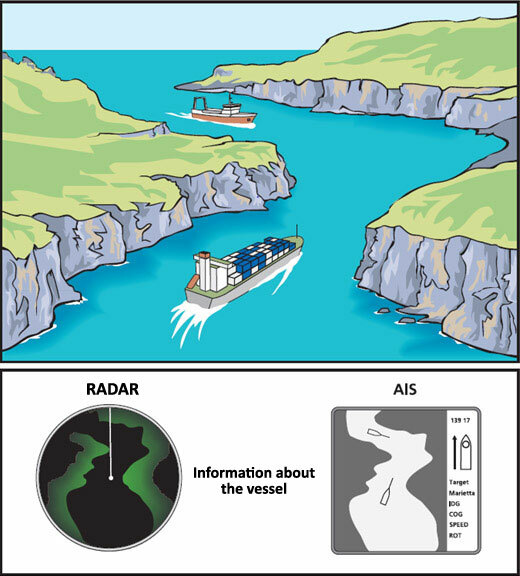 The AIS has various advantages over the radar. Captains on vessels that have this system on board can see other vessels nearby if they have the same system on board, even though the vessels are not in sight and a radar beam does not reach them. It is also an important advantage that on the AIS it is possible to store information about vessels’ navigation in a database.